JACKSONVILLE, Fla. - The Jacksonville Jumbo Shrimp's Neck Pillow Giveaway, presented by JAXSPORTS Council, was selected as Minor League Baseball's Promotion of the Month for June, announced by the Minor League Baseball Promotional Seminar on Thursday. During each month of the 2017 season, Minor League Baseball recognizes one promotion or event as the Promotion of the Month. Clubs named Promotion of the Month winners are automatic finalists for a Golden Bobblehead Award - Minor League Baseball's highest award for an individual promotion - at the annual Minor League Baseball Promotional Seminar. "We seek to bring affordable family fun with unique, fun experiences and giveaways, and it is an exciting and great honor to be recognized by our peers for promotional creativity," said General Manager Harold Craw. "The Jumbo Shrimp Neck Pillow seemed perfect for the inaugural Jumbo Shrimp season, and we were glad to have the JAXSPORTS Council as a partner in the night. We look forward to creating more fun giveaways for our great fans in Northeast Florida." The seventh annual Golden Bobblehead Awards presentations will be awarded for Best Theme Night, Best In-Game Promotion, Best Non-Gameday Event, or Best Community Promotion or Event on Thursday, Sept. 28, at Fluor Field at the West End in Greenville, South Carolina, home of the Greenville Drive. Before the June 17 giveaway date, in May, MLB.com Cut4 listed the Jumbo Shrimp Neck Pillow - shaped as a Jumbo Shrimp - as the No. 1 giveaway among its top 10 by Minor League Baseball teams this season. The neck pillow was given to each of the first 1,000 fans through the gates on Saturday, June 17. The Jumbo Shrimp have a unique giveaway item for the first 1,000 fans entering the Baseball Grounds of Jacksonville each Saturday. The Jumbo Shrimp's promotion was the winner among five June finalists, which also included the Gwinnett (Ga.) Braves' "Goat Yoga," the Brooklyn (N.Y.) Cyclones' "Paw Patrol/Vs. Cancer," the West Michigan Whitecaps' "Corgi Races," and the Myrtle Beach (S.C.) Pelicans' "Cubs-A-Palooza." 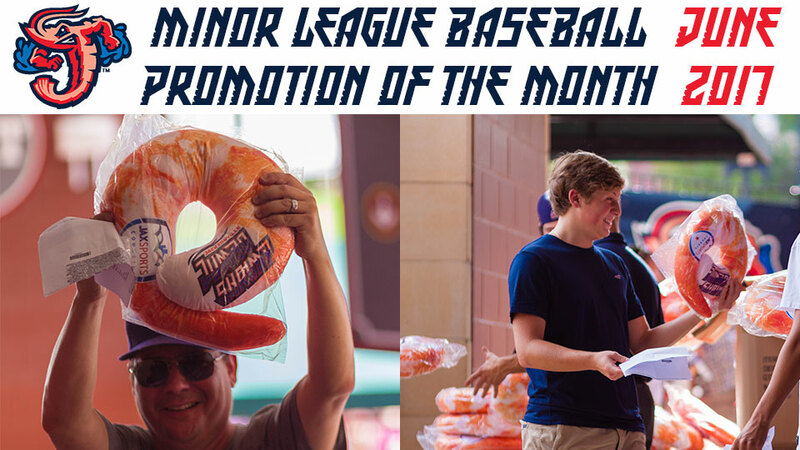 This season's Promotion of the Month winners include the Charleston (S.C.) Riverdogs' "Silly String Night" in April, and the Corpus Christi (Texas) Hooks' "Dia de los Hooks." UP NEXT: The Jumbo Shrimp return to Jacksonville Wednesday, July 19, at 7:05 p.m. against the Tennessee Smokies. For Canines & Crustaceans Bark in the Park, the Jumbo Shrimp welcome dogs to the ballpark, free of charge with a paying human companion. Dog-free seating will be available in Sections 110 and 111. Gates open at 6 p.m. for the Date Night Special, when a package of two tickets, two hot dogs, two sodas and popcorn is just $20 at the box office windows.